Hanging Out, originally uploaded by SkeletalMess. all i can say is that you are so talented! i wish i had your knowledge and flair! the chickadee is awesome! This is so beautiful see, especially when everything is white here in Michigan. Two favorites in an awesome capture~ you're such a treasure Jerry! They are gorgeous, excellent capture! I LOVE birds and miss having these kind in Southern California. Thanks for so generously sharing your talent! 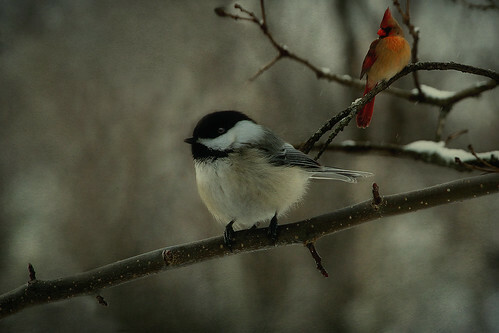 If the bird's could speak,they would thank you for such a beautiful portrait of themselves. It is truly awesome. Just found your site and wanted you to know that your work is excellent. Keep working the camera. I love this picture and all the others as well. Thank you for sharing. you are too good. seriously!